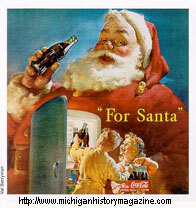 Santa Claus is not so much a person as he is an idea, but this idea started with a real person many centuries ago. Around the world, “Santa” has many names: Santa Claus, Sinter Claas, Saint Nicholas, St Nick, Kriss Kringle, Father Christmas, 圣诞老人 (literally: holy birth old person) and many more. But the first “Santa” lived in the 4th century; he was a Christian leader named Nicholas, living in what we now call Turkey. After his wealthy parents died, he spent his life secretly doing good things for others, especially children, the poor, and sailors. He was later honored with the Christian title “Saint,” and thus became St. Nicholas. Like many governments before and since, the leaders of the Roman Empire considered Christianity to be a threat, so St. Nicholas and other Christian leaders also spent many years in jail because of their deeply-held faith. One of the most famous stories of Nicholas’s generosity is about a poor man who needed a dowry for each of his daughters. When it came time for the oldest daughter to marry, Nicholas dropped gold coins down the poor father’s chimney, and they landed in the daughter’s socks (which were hanging by the fire to dry). Everyone thought it was a miracle. Money also mysteriously appeared the night before the next daughter was to marry. When it came time for his youngest daughter to marry, the poor man stayed up all night and discovered that the gifts had come from Nicholas. By the time he died, Nicholas was so well known for secretly supplying needs that people were giving him credit for every unexpected gift. Later, his kindness was remembered with “the Feast of St. Nicholas” in early December, which eventually moved to Christmas Eve. As Christianity spread from culture to culture, the man’s name was translated differently. In Holland it is “Sinter Claas,” which became “Santa Claus” (or just “Santa” or “St. Nick”) in America. In each country, the character is a bit different. In Holland he has a tall red hat and uses a white horse; in the UK, “Father Christmas” is tall and slender; in Russia, “Grandfather Frost” has a red suit and white beard; in Germany, “Pelze Nicol” or “Kris Kringle” may wear fur or bells and arrive by mule or horse; in Sweden, “Jultomten” is a short elf (with a red tasseled cap and a long white beard) who rides a goat. In other countries, children say gifts come from the “three wise men” or some other character. Countries where the celebration of Christmas is relatively new (such as China and Japan) have adopted the American Santa Claus. Wherever he is remembered, and no matter how you picture this jolly gift-giver, “Santa” has come to symbolize generosity at Christmastime all over the world. three wise men: part of the Christmas story, which says that “wise men from the east” saw a new star proclaiming that a king had been born in Israel; they followed the star and found Jesus, and then gave him precious gifts (gold, incense) to show their respect and worship. This resource was created for our students under my understanding of “fair use” for educational resources.